On May 25, the organization gave its Armistead Robinson Faculty Recognition Award to Deborah E. McDowell, director of the Carter G. Woodson Institute of African American and African Studies, and the Alice Griffin Professor of English; and its Dr. Lincoln V. Lewis Staff Award to Kellie Sauls, director of admissions and financial aid at the Frank Batten School of Leadership and Public Policy. McDowell, the faculty award winner, follows in the footsteps of the award’s namesake, Armistead Robinson, who directed the Woodson Institute from 1980 to 1995. McDowell’s nominator, Cynthia Hoehler-Fatton, an associate professor of religious studies, credited her with revitalizing the institute and leading it to major growth. When McDowell took over the institute in 2008, it was awarding only two pre-doctoral fellowships and one post-doctoral fellowship annually, and its core faculty had dwindled to the equivalent of 1.25 full-time members. McDowell immediately began bolstering those ranks. She aggressively sought out opportunities to make interdisciplinary hires, collaborated with numerous departments in the College of Arts & Sciences and embraced new funding sources. Today, the institute’s faculty ranks include five half-time faculty members, two full-time lecturers and two incoming full-time members, and the institute is supporting eight to nine fellows annually, Hoehler-Fatton wrote. McDowell’s efforts extend well beyond the Woodson Institute, Hoehler-Fatton noted. 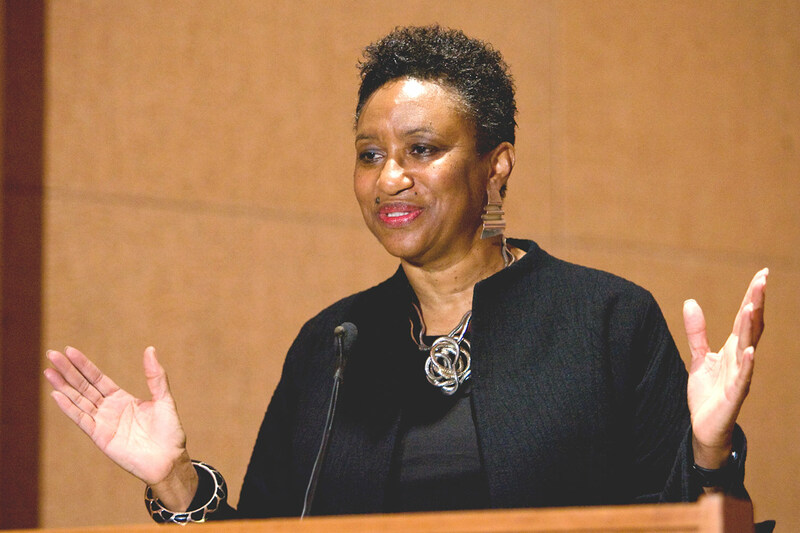 “Deborah has passionately, eloquently and repeatedly made the case for increasing the number of black faculty at our university,” and regularly meets with African-American candidates for positions across Grounds to offer her support, she said. Hoehler-Fatton also hailed McDowell’s efforts to promote inclusion and equity amongst undergraduates, including assisting in the formation of an African-American studies “Majors Union” and the establishment of weekly “What’s Trending?” lunches where undergraduates, faculty and Woodson Fellows gather informally to discuss current events. Sauls, formerly the director of diversity initiatives and programming at UVA’s Darden School of Business, is active in the Disability Advocacy and Action Committee, the Office of African American Affairs Faculty Mentor Program, the Charlottesville Area Community Foundation and the TEDx Charlottesville Steering Committee. She was selected for the UVA Center for Leadership Excellence’s 2016 Cornerstone Program, which identifies and develops promising young leaders on staff at UVA. 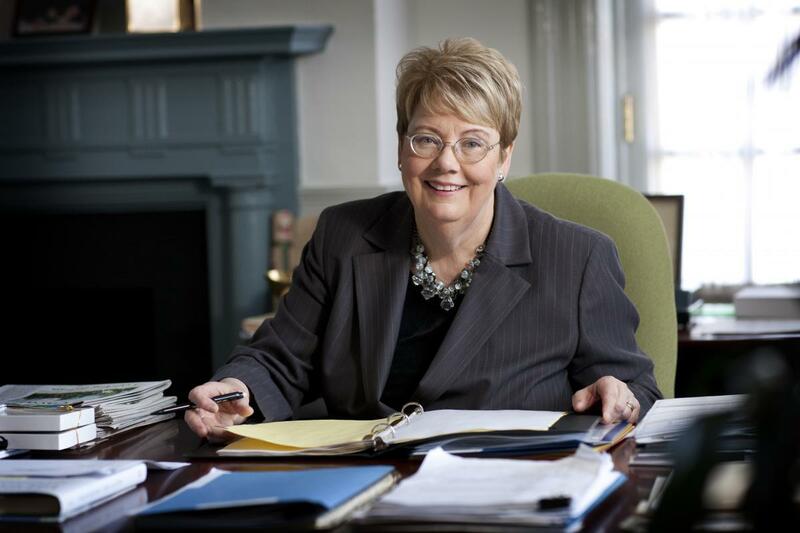 UVA President Teresa A. Sullivan has strengthened the relationship between the University and its College at Wise by advocating for the small liberal arts school with state government in Richmond and beyond, encouraging interaction between the two institutions, and serving as trusted counsel to its senior leadership. For those reasons and more, UVA-Wise Chancellor Donna P. Henry presented Sullivan with the Samuel R. Crockett Award, an honor bestowed upon a University official who has worked hard to strengthen the relationship between the Grounds at Charlottesville and the campus at Wise. Henry presented the award May 6 at the meeting of the Board of Visitors’ Committee on the University of Virginia’s College at Wise. Henry said she and others at Wise know they can reach out to Sullivan and her staff at any time for advice or to share critical information. The award is named for Samuel R. Crockett, one of the College at Wise’s co-founders. 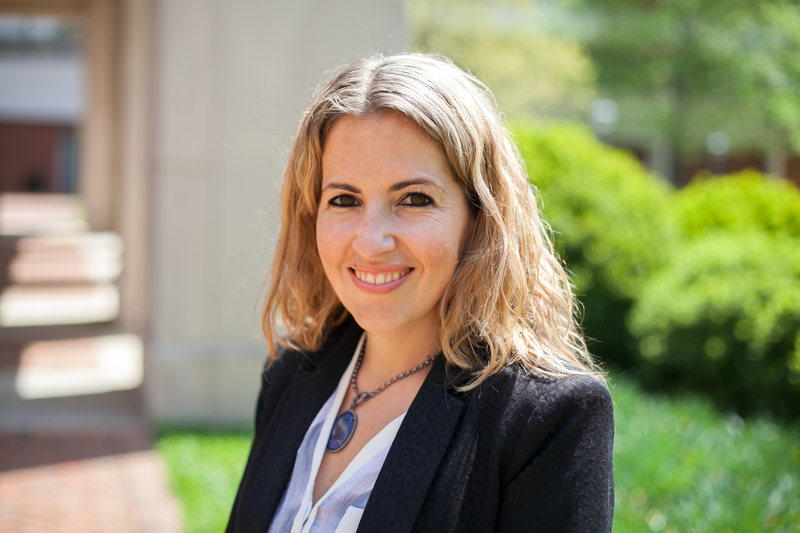 UVA School of Law Professor Mila Versteeg, who is among a small group of scholars to be the first to employ empirical methods in comparing the world’s constitutions, has been awarded the Law School’s Carl McFarland Prize. The award is given in the spring to recognize outstanding research by a junior faculty member. Versteeg, an expert in constitutional study whose research also extends to other aspects of international law, joined the Law School faculty in 2011. She also directs its Human Rights Program. Versteeg is already author or editor of several dozen published works. Her recent insights include the discovery that the U.S. Constitution is declining in influence worldwide and that constitutional prohibitions of torture aren’t always effective as deterrents. Versteeg said she is flattered to be recognized for her early-career contributions. 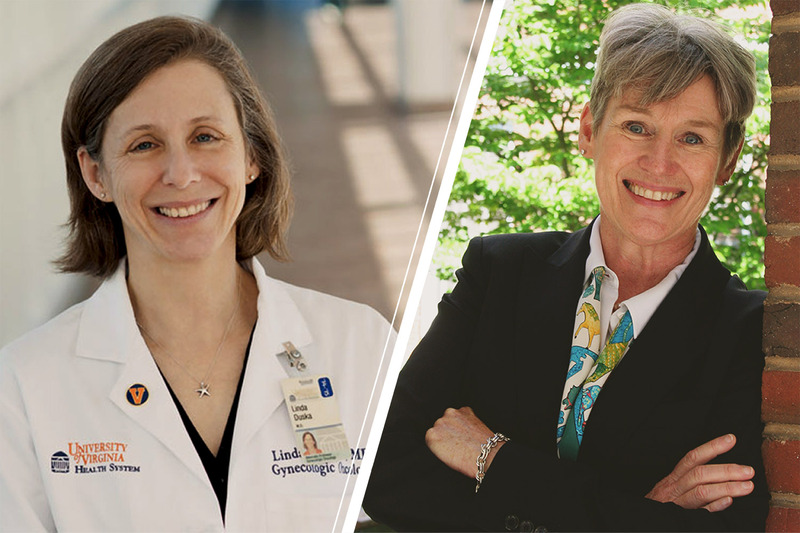 Two UVA School of Medicine faculty members, Dr. Linda Duska and Dr. Susan Pollart, are among 54 women nationwide accepted into the Hedwig van Ameringen Executive Leadership in Academic Medicine Program, a year-long, part-time fellowship for women faculty in schools of medicine, dentistry and public health. Established in 1995, the program – run by the Institute for Women’s Health and Leadership at Drexel University College of Medicine in Philadelphia – offers an intensive one-year fellowship of leadership training with extensive coaching, networking and mentoring opportunities aimed at expanding the national pool of qualified women candidates for leadership in academic medicine, dentistry and public health. The program has been specially developed for senior women faculty at the associate or full professor level who demonstrate the greatest potential for assuming executive leadership positions at academic health centers within the next five years. The Association of Women’s Health, Obstetric and Neonatal Nurses on Monday presented its 2016 Award of Excellence in Research to nursing professor Jeanne Alhusen for her excellence in nursing research and continued innovation in the delivery of care for women and their families. The association presents the annual award to a member who demonstrates a history of conducting grant-funded research, publishes research in peer-reviewed journals, reflects the association’s goals and standards in their contributions to research, and demonstrates clinical applications of research. The award was presented at the group’s national convention in Grapevine, Texas. Alhusen – an associate professor and the assistant dean for research in the School of Nursing – focuses on maternal mental health and its relationship to developmental outcomes in young children. With more than 20 years of clinical experience, Alhusen is a board-certified family nurse practitioner and has dedicated her career to addressing the needs of families living in poverty. Geoffrey M. Geise, an assistant professor of chemical engineering, and Mete Civelek, an assistant professor of biomedical engineering, have been selected for the Oak Ridge Associated Universities’ Ralph E. Powe Junior Faculty Enhancement Award, in recognition by academic peers of the quality and promise of their research. Each year, Oak Ridge Associated Universities’ member institutions are permitted to nominate up to two junior faculty members for the award to enhance their research. The organization provides $5,000, matched by $5,000 from the member institution. A UVA faculty review group makes nominations to Oak Ridge for the award. Geise and Civelek were two of only 35 junior faculty from across the nation selected for the award, chosen from 132 applicants from Oak Ridge Associated Universities’ 121 member institutions. APPA: Leadership in Educational Facilities, a national organization for educational facilities managers, has selected UVA’s Division of Facilities Management to receive its 2016 Sustainability Award. The University will receive the award July 12 at the organization’s annual conference in Nashville. The award recognizes a facilities management department that has integrated sustainable policies and “green” practices throughout all facets of the organization and embedded them within the educational institution. Doctor of nursing practice student Laura Trissel was recently selected from among 2,000 applicants for the 2016 American Cancer Society Graduate Scholarship in Cancer Nursing Practice grant to fund her studies. The $20,000 grant – which will cover Trissel’s last two years of tuition at UVA – is offered annually to a master’s or doctoral student specializing in oncology nursing. Trissel – who continues to work two days a week as an oncology nurse at Sentara RMH Hahn Cancer Center in Harrisonburg, while enrolled in full-time coursework – finds the “science behind tumor biology fascinating and complex,” and is energized by the “ever-changing landscape of how we treat cancer,” she said. She’s particularly interested in ovarian cancer, which is frequently diagnosed at a late stage in patients who often undergo long courses of chemotherapy and endure debilitating side effects and uncomfortable symptoms. “I’d love to find better symptom management strategies and early interventions (both medical and emotional) to help these women and their families through their journeys,” said Trissel, who also earned an Oncology Nursing Society Foundation doctoral scholarship last month. She is on track to earn her doctor of nursing practice degree from UVA in 2018. John R. Scully, Charles Henderson Professor of Materials Science and Engineering and interim department chair, has earned the Electrochemical Society’s 2016 Henry B. Linford Award for Distinguished Teaching. The international award is bestowed upon one outstanding teacher every other year in May. The Electrochemical Society, a non-profit educational organization with more than 8,000 members in 70 countries, established the award in 1981 for excellence in teaching in subject areas of interest to the society. Scully is a fellow of the Electrochemical Society as well as the National Association of Corrosion Engineers and the American Society for Metals. In 2010, he received the Electrochemical Society’s H.H. Uhlig Award for excellence in corrosion research and outstanding technical contributions to the field of corrosion science and technology. At UVA, he has mentored more than 35 Ph.D. students, 13 post-doctoral scholars and many undergraduate students and visiting scholars. “John Scully is the model for junior faculty in terms of their aspirations to succeed as an academic,” said Ronald Latanision, senior fellow for materials and corrosion engineering at the research firm Exponent, professor emeritus at MIT and member of the National Academy of Engineering, in a letter supporting Scully for the award. “His students are regularly expected to speak at professional society meetings, and they are supremely well-prepared. It is very clear that John really cares about these young people and that they appreciate this care. This preparation is enormously important as they launch their own careers. I look for University of Virginia graduate students when we have openings on our staff and we hire them as often as we can!" Scully has focused on the recruitment and success of women and individuals from other demographic groups underrepresented in engineering. The Electrochemical Society recently ranked a group of 32 students from Scully’s Center for Electrochemical Science and Engineering as the No. 1 group in the United States. Nicola Bezzo, an assistant professor in UVA’s Department of Systems and Information Engineering, has earned Robotics & Automation Magazine’s inaugural Best Paper Award. Bezzo’s paper, “Robot Makers: The Future of Digital Rapid Design and Fabrication of Robots,” was published in the December issue of the magazine, published by the Institute of Electrical and Electronics Engineers. “The paper discusses the main challenges, problems, vision, and future steps on the topic of codesign and rapid fabrication of robotic systems using innovative techniques like 3-D printing, origami and self-folding techniques, and soft materials,” Bezzo said. He received the award May 19 in a ceremony in Stockholm. UVA graduate engineering student Heimir Thorisson has received the 2016 Leadership Award from UVA’s International Studies Office. Thorisson, who received his M.S. in systems engineering in May, is from Iceland. He is a Fulbright Scholar and has written or co-written multiple journal papers and presented at international conferences. Additionally, Thorisson served as president of the UVA chapter of the Institute for Operations Research and the Management Sciences. As a graduate research assistant, Thorisson worked on projects including Afghanistan infrastructure reconstruction, sponsored by the U.S. Department of Defense and USAID; container port data analytics, sponsored by the Commonwealth Center for Advanced Logistics Systems; and risk analysis for multimodal transportation corridors, sponsored by the Virginia Department of Transportation and Federal Highway Administration. Thorisson will continue on in the Ph.D. program in Systems Engineering at UVA. A collaboration between multiple Engineering School departments has earned the 2016 R.A. Glenn Best Paper Award from the American Chemical Society. The paper, which drew from May Ph.D. recipient Elizabeth Connelly’s dissertation, is titled “Algae biofuel production strategies: What have we learned from LCA and TEA and what does it mean?” Its authors include Connelly and her Ph.D. co-advisers: Associate Professor Lisa Colosi Peterson and Associate Professor Andres Clarens of the Department of Civil and Environmental Engineering, and Research Professor James Lambert of the Department of Systems and Information Engineering. The Glenn Award highlights the most interesting and innovative paper presented at the American Chemical Society’s annual national meeting. The research, which focuses on biofuels and supply chains, was supported by sponsors including the Commonwealth Center for Advanced Logistics, the Virginia Center for Innovative Technology, the Federal Aviation Administration, the National Science Foundation, the Virginia Center for Transportation Innovation and Research and the Virginia Department of Aviation.